Before students are introduced to technology use in the classroom, it is important to teach students digital citizenship. If students are not explicitly taught the importance of online safety and etiquette then there is the potential for unwanted behavior from students when they are online. 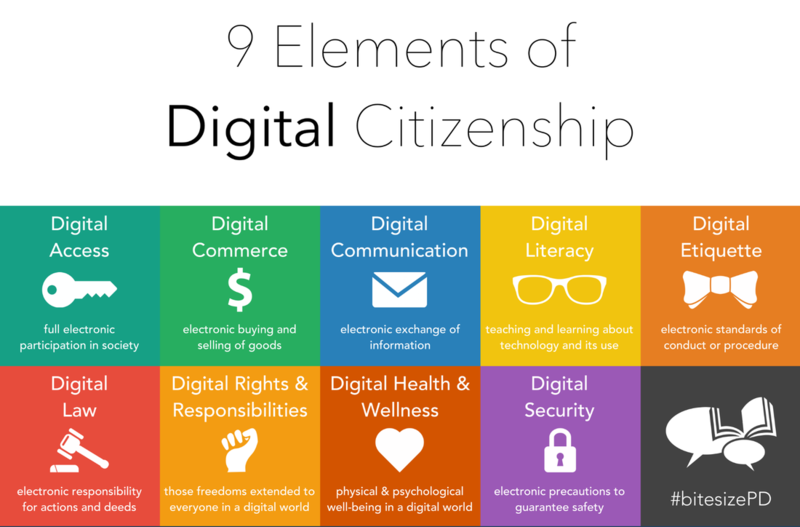 There are 9 important elements of digital citizenship in the areas of respect, educate and protect as described in the chart below. Common Sense Media is a helpful site where students and families can learn about how to use technology and media safety. You will also find a lesson plan I used my students. Nearly all of the International Society for Technology in Education Standards list digital citizenship as one of the aspects of education technology that all members of a school or district should support. Specifically, the standards tend to focus on the safe, legal and ethical use of technology in schools. ​Kids who learn to use digital media wisely can accomplish amazing things — learn new skills, explore new worlds, build new ideas, and change the world. Students will develop an understanding of the concept of blogging as a way to communicate their thinking and learning with an authentic audience.